What is the value of all this social media? Submitted by Truffle Media N... on December 4, 2009 - 5:35am. 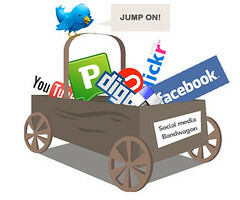 Jump on the social media bandwagon by Matt Hamm Here at Truffle labs we have been experimenting and participating in / around new/social media tools and methods for several years. Along the way we have sought to discover where the pay off occurs (aka the ROI). Currently we use Twitter, LinkedIn, and some Facebook. Behind the scenes (in those InterTubes) we use tools like Yahoo! Pipes, Ping.fm, Drupal, Google Analytics, DabbleDB, UberVu and more to bring some meaning to data we collect. As we invest people and dollars in understanding and developing social media processes, we continue to strive be in line with our company goals. How do my various tweets and posts through the week create value? Value for whom? And does that value fit well with company goals? I constantly think about what I need to do on a daily basis and what impact my social media actions will have on our company six to 18 months from now. Chris Penn and John Wall, in their Marketing Over Coffee podcast, talk out all sorts of interesting ideas, tools, approaches, and tidbits. I want to try them all! Chris Brogan keeps reminding me that sometimes you need to say "No!". There are many integrated services that offer lures of social media "success" that trigger my "not possible" alarm but I want to believe. This is all a work in process. There are many tools to be reviewed and experiments to run. What questions should be asked? What directions should be taken seriously and what should be avoided? Who are some key hubs to reach out to? Are we over thinking the use of social media<=>ROI? Here is transcript of Dec 11, 2009 smROI conversation. You can also discover more in Twitter using the #smROI tag to pull social media and ROI threads together.